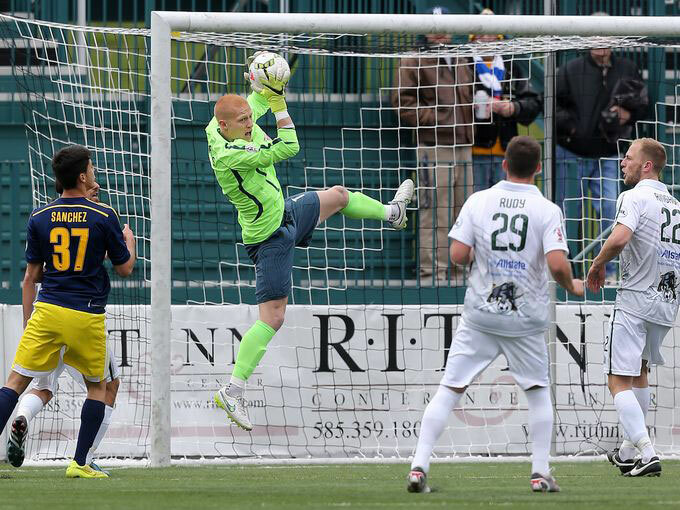 Adam Grinwis of the Rochester Rhinos, one of the top young goalkeepers in the USL, has grown and developed as a player over the years. 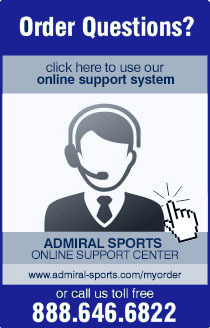 Much of the credit for his success should go to the Michigan Bucks, a team he joined at the tender age of 18. Grinwis’ time in the PDL was the stuff of legends as the Ada, Michigan native put in some of the most dominant performances that the league had ever seen. The highlights include a regular season title (2012) and PDL North American Championship (2014) to go along with several individual honors. 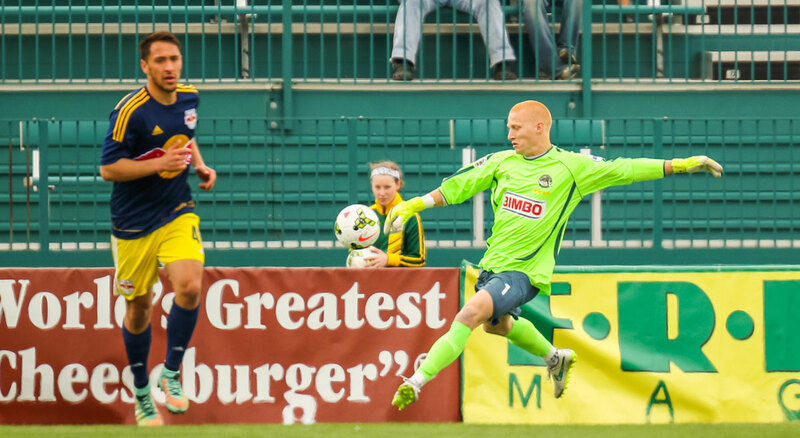 Grinwis earned the PDL Rookie of the Year and Goalkeeper of the Year awards in 2012 in addition to being named MVP of the 2014 PDL playoffs. All of this coincided with an equally stellar career at the University of Michigan, where Grinwis became one of the top goalkeepers in the Big Ten and the country. He believes that college soccer was a necessary part of his soccer journey, one that has led him to the professional ranks. He does believe that his massive success with the Rhinos wouldn’t have happened without the help of the Bucks and the PDL. Getting massive exposure and lots world-class experience is what happens every day with the Bucks, one of the most storied programs in PDL history. They are a club that produces professionals on a very regular basis. But that is not to say the journey was easy for Grinwis. 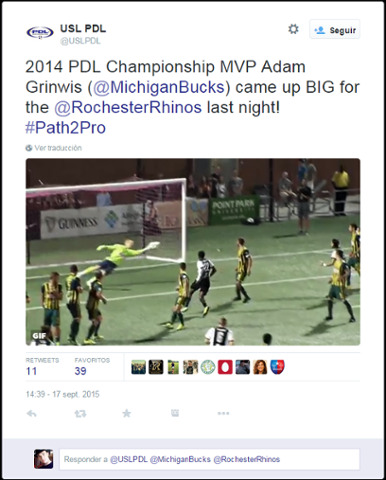 Now Grinwis has the opportunity to play the best professionals as a member of the surging Rochester Rhinos. The New York side has been absolutely dominant this season, finishing atop the USL’s Eastern Conference. The results have been downright incredible as the Rhinos compiled a 16-1-10 record in 2015 with 58 points from 27 games. This was significantly higher than the leaders in the West. For Grinwis one of the best parts of playing in Rochester has to be playing with three other Michigan Bucks alumni: Tony Walls, Marcos Ugarte, and Drew Ruggles. In a short time Grinwis has made a name for himself throughout the USL thanks to massively spectacular saves like this, one that generated discussion across the country. This is just one save and Grinwis is capable of so much more. Just ask Rhinos head coach Bob Lilley. And so is the rest of the country, waiting, just waiting to see Grinwis on a bigger stage. Perhaps it will be MLS or maybe even overseas. One things is for certain: the Michigan Bucks played a huge part in this success story.